Kirk makes a custom cage for the RX-7 (see notes from David Liberman below). Autopower is a supplier of pre-fabbed cages. I haven't yet called them to see what they have for the RX-7. They make street and race bars, and bolt-in and weld-in cages. They claim to make the only race-approved bolt-in roll cage, but I am not sure of what sanctioning body. Mostly Mazda is now offering a roll bar. Other people have had roll bars custom made. Check the rules in your type of racing for bar diameter, wall thickness, grade of steel, etc. The Autopower bars meet the SCCA Solo II regs. The Autopower rollbar I tried to install blocked your rear vision, reduce seat travel by 50% and at my height 5'11" was my headrest )( ie, your head without helmet was touching the top hoop). I junked it - wasted money. For the same $'s when you include the installation, you can have Pettit or the shop that does his cages (Motorsport technology I think) to fabricated a custom welded in or bolt in roll bar. The one they did for me (welded in) doesn't restrict rear vision at all. In fact, I often have to point out to people that there is a roll bar installed. There are a few commercially available Roll-Bars. Every one I have seen mounts at the corner of the floor by the frame rail and cross member. These could be bolted or welded in. They sit in front of the storage bins and do limit seat travel. I needed to keep the seat travel and did not mind losing the storage bins. I had a custom bar built. Pictures. Thanks for all the responses about my request for info regarding bolt-in roll bars in a 3rd Gen. I have some follow-on questions. The 3-4 responses I got all referenced the Kirk Rollbar as being one to consider. No one mentioned the Autopower in a positive light. The other option is custom made, which I am strongly considering. Talk with Kirk Racing Products, here in Birmingham. Their number is (205) 823-6025. 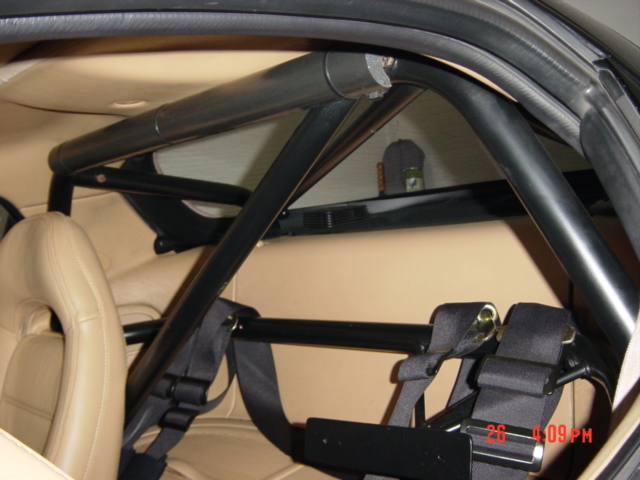 For the person that was looking for pictures of a rollbar install, here's a rollcage. contact with any part of the bar/cage. It’s even required by the SCCA. finish information with your order; if you don’t, it’ll be painted gloss black. six hours (seat removal required). Thank you for your interest in our products. We have several options available for the 3rd Gen RX7 depending on your needs. If you plan to run something such as SCCA Solo I class or most time trial type driving schools/track days you may be looking for a 4 point competition bar. We have one design that allows you to retain your storage bins in the back and another design that requires that they be removed to gain additional seat motion. The latter bar is usually preferred by only the very tall driver. Either of these would be made of a 2" x .180 wall tubing and run $325 plus shipping. This would be legal through SCCA Solo I. If you plan to do more wheel to wheel competition or if you feel that you will be reaching speeds that warrant a 6 point cage, you may choose either a weld-in or bolt-in model. The showroom stock design in a DOM weld-in model runs $490 while a DOM bolt-in runs $540. If you have a commercial address available for shipping (assuming Indianapolis area) I should be able to get any of these products to you for around $60 to $75 shipping. Let me know if you have any questions or if there is anything else I can help you with. I have pictures of the Kirk racing 6 point roll cage. You can view it from my web page. > $300. Current  price should be around $325 not $450 as indicated by RP. I don't think the price you listed $325 includes the shipping. $450 is something you pay for having something already in stock. If you order one striaght from kirk racing, it may take 2-4 weeks to built. RP has these cages in stock in which they paid shipping for from AL to Tx. That's just part of the overhead you have to added in a business. To give you another Example, we had a group buy on J&S knock sensor last year. If I remember correctly, the waiting period was anywhere from 2-3 months. You can definately get it alot cheaper from direct but there is always a tradeoff somewhere. Speaking of Kirk Racing rollbars. I thought they are built well, but I found them very irritating. 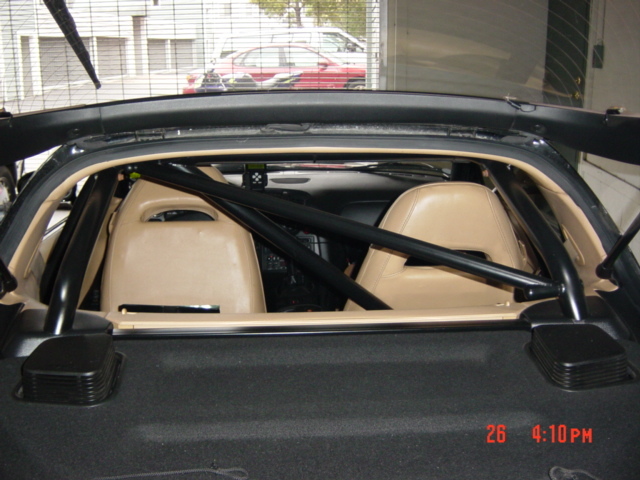 For one you lose the bins in the trunk, the Japanese roll bars use the shock towers to tie into the frame, much more convenient. But that's the least of my worries, its the fact that only the driver has room to move the seat back while the passenger can't. It might not matter to some, but to me this is a serious problem. It makes taking any reasonable sized person with you very uncomfortable, renders the front seat useful only to kids. I would never consider the Kirk Racing. Stop by http://www.efini.net/re.htm. I will put the picts up soon. But the point of this post, I am offering to help anyone close to me install it...man I love this bar...did I mention I love this bar? Pricing...I have no clue how much it costs, I still need to square it with Brian as I paid extra on my end for shipping when it arrived and he paid extra for shipping on his end (really long story, don't ask) and it's a prototype, he has all the jigs to make it for production and when we met at MADS we went over the details for installation and discussed some of the problems and I told him how much I love this bar...damn I love this bar! > of it's mount points? I will soon, I didn't really have time while installing it the first time without the diagonal brace. The second time I installed it with the diagonal brace (I had to remove most of it to fit the diagonal) was at the HOJO with 5 other list members working until 2:30am at the hotel's drop off driveway Friday night, so taking pics was the last thing on my mind at the time. But I hope someone did at MADS, if so can you please let us know as this weekend I will be busy preping the car for the autocross. >How many mount points are there? There are 4 points, like most standard roll bars it mounts to 2 on the floor for the loop, but the other 2 points are at the shock towers. It comes with 2 new shock tower mounts. The shock tower mount tops hold the tubing coming from the loop and a new brace. The brace currently doesn't have taps for holding the rear cargo cover but Brian tells me the production version will. The 2 points on the floor for the loop are held on the other side by a thick chrome-moly backing plate. I was unable to match the 4 hole in the base of each side of the loop to the backing place because I didn't have all the right tools to drill the holes perfectly straight. Next morning Rich Farrell Sr. got me large 2" washers and 1" washers to lay on top of each other and use them on the underside with the nut. Its a temporary solution until I get an appointment with my welder. There are many small but really smart details that are difficult to explain, I will show them when I photograph it. I'll be glad to help anyone in the Northeast install it, perhaps then I can do a writeup with photos showing it step by step.The tolerances are so small that if you do not install it in exactly the right order it will not fit easily. Once it's in though it is solid, making it worth all the effort. Subject: Re: (rx7) (3) reviews on M2's new rollbar?? My impressions are based on what I believe is one of the last prototypes. It was the main hoop with 4 mounting points and the rear diagonal. The finish is very nice. The example I saw was powder coated a "chromey" silver. The finish was uniform and after repeated installations and removals, seemed quite durable. It fits the contours of the interior very well (especially along the side of the car, just behind the seats) and is just about as unobtrusive as a roll bar could be. The rear supports bolt into the top of the rear shock towers and allow for use of the rear bins (which I thought was nice). The fit is very snug and removal and installation take a bit of effort. It's certainly not the kind of thing I would be looking forward to taking in and out every couple of weeks, but it's not that bad and having 2 people helps matters greatly. Although installation and removal were hindered by the snug fit, once installed there was some movement of the bar on its mounting posts leading to some squeaking. This seemed to be alleviated by wrapping the posts with electrical tape before installation. Again - - this may now be corrected, as I believe the example I am familiar with is a prototype. I like the M2 better, but the Kirk unit really is the next best thing. It's more desireable because it is SCCA legal for Solo I competition, and at less than 1/3 the cost! >Are you talking about a simple hoop, crossmember and cubby braces? >It contains a main hoop conncted to both inner fenders through the jack and tools panels. You can cut your stock lids for a neater appearance, but the storage space will pretty much be taken up. There is a seat-back brace bar and one diagonal as well. There is at least one picture on the internet that somebody forwarded to me... is that person listening? Also, when I talked to the main guy at Kirk, he said he would put a point at the top of the main hoop and make it 1/2" taller for better rearview visibility and it would still be SCCA legal. No added cost... I think it came to $337, but can't recall if that was before or after shipping. Personally, the Kirk does the job, but if you can save up the extra money for the M2, go for it. As for the Solo-I requirements, I'd double check, but last I heard that was heresay. Obviously the ultimate source for that, is a GCR, and I'm not sure what about the M2 (never could get an answer from anyone on this list) was the issue in not being SCCA approved. Also, keep in mind, lots of folks do custom cages, and that may be a better option for the ultimate in fit/finish. But be careful of who you select and make sure you see examples installed in street vehicles, not in a gutted race/track car. I initially went this route, but didn't have time to really investigate in depth the gravity of how many dollars would be sucked from my wallet. Bill and I also talked about using the main hoop, and getting the rear piece remade. Also, mine and Bill's install (about 1 year ago) the hatch struts don't coexist with the rollbar. Read: the hatch is one heavy bugger, and loading/unloading cargo is a HUGE PITA. I'm told that the placement of the rear supports makes/breaks this, and I reiterate, in my case, I had to use a port-a-power to get the supports to get anywhere near close. If I knew I had to be 1/4" accurate, I might have done it differently, but the install instructions (single page sheet) didn't say anything about that, IIRC. The Kirk bar is SCCA approved unless something has changed drastically, he wouldn't make it if it wasn't. Mark uses the bar in his Solo I car and specifically designs it around SCCA specifications as far as everything he's told me. I think he's talking about the M2 roll bar. Last I knew, it did not meet the SCCA specs because it's wall thickness is too thin for chromolly construction. The Kirk rollbar has always been,and still is approved for SCCA racing, and they can even tech it for you. 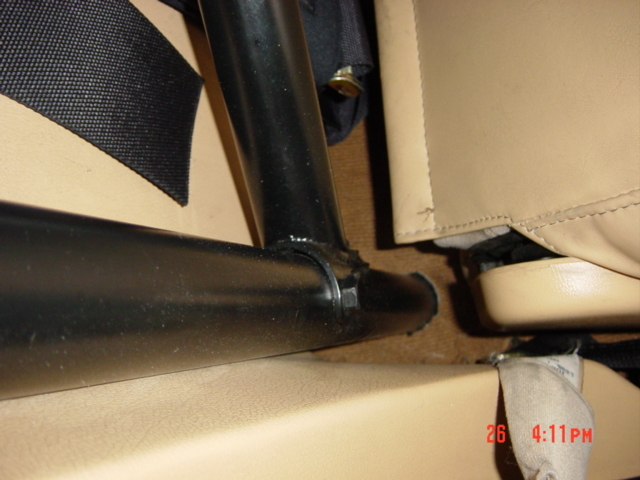 I have had a 1 3/4" Kirk Racing roll bar for several years. Here are a few of my observations. The installation was fairly easy - I installed it by myself without any help in about 3 hours. I had no issues except i had to re-drill one of the bolt holes on the floor mounting plate becauuse it was impinging on the tubing itself. Without re-drilling, the bolt would not clear the tubing of the bar. After the bar was installed, I sprayed on undercoating over the bolts. The undercoating was of the spray can variety available at any auto parts store. I have no rubbing issues whatsoever with the ceiling(I have an R1), hatch struts or the plastic interior. I am very happy with my roll bar except that I wish Kirk Racing would make it in Chromoly (to save weight). I saw someone mention that the M2 rollbar was contracted out to Kirk. Just for clarity, I did want to point out that the 2 rollbars appear to be quite different. I have the M2 bar in chrome moly, and I got the full deal - 2 diagonals, seat back bar, seat back brace, powder coated black. The bar fit perfectly, and mounts to the top of the rear shock towers, so you do not lose the jack cubby bins. Because of one of the diagonals, I lost almost all passenger seat travel and recline. I believe there are about 3 clicks of recline, and less than half of the fore/aft travel. This is not a problem most of the time, but surfaces when I instruct at the track and have taller students. It gets VERY uncomfortable for them, particularly since they're wearing helmets to boot. Nevertheless, I am very happy with it, and the install is VERY CLEAN, thanks to Doug at Diablo Imports. I can easily take pictures of the M2 bar if anyone wants them. Thanks to the great install, there are almost no visible modifications to the interior of the car - I still marvel at how cleanly Doug put it in. It almost looks like it came from the factory with the bar in it. I got the 2 inch Kirk Racing bar for $335.00 plus $62.00 for you come and pickup freight truck. Page 2References:"Federal Register," National Highway Traffic Safety Administration, US Department of Transportation 1998.Head Injury Reduction with padding in Roll Bar SystemsPadding has been used for energy management for decades. The interior of motor vehicles has been identified as an area where injury can occur in frontal, side, rear, roll over, or oblique impacts. Head impacts with the roof, pillars and support structures have been studied by Fan (1998), Monk (1986) and Partyka (1988). Recent rule making by the National Highway Traffic Safety Administration has identified padding as a potential mechanism for reduction of head injury. Federal regulations for occupational protection in interior impacts is given in the Federal Motor Vehicle Safety Standards rule 571.201. The regulation applies to interior velocity components including headers, pillars, side rails, roll bars, and braces and stiffeners. Standards and studies of helmets for energy management have been reviewed by Becker (1998) and Meyers (1993). Although it is well known that the padding decreases impact accelerations, a comprehensive study from the perspective of head injury reduction including angular acceleration is lacking. The existing standard to determine the effect of padding is based on the one-dimensional spring-mass impact system (Federal Register, March 1998). This approach is applicable to calculate the peak acceleration. It is, however, not possible to directly quantify the angular acceleration and velocity, and Head Injury Criteria. Therefore, the determination of these responses during various padding conditions is necessary to address the biomechanical effects of padding. Furthermore, such quantification permits the determination of the relative effect of padding on the biomechanical responses (e.g., reduction of angular acceleration versus HIC). The present study was designed to evaluate the variations of head injury biomechanical responses due to various roll bar padding materials under different impact velocities. The first study was conducted with three different types of padding examined. All padding was approximately 25 mm thick. The baseline structure was an unpadded production brush bar. The first type of foam, Simpson roll bar padding, was directly attached to the baseline 32 mm diameter steel structure. 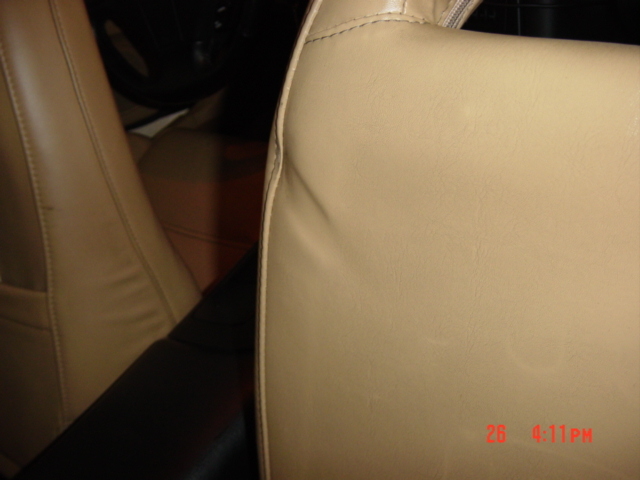 Simpson (1999) roll bar padding is a "BeadAll" foam manufactured by DuPont. It is similar to the foam used in their helmet liners. The 0.9 mm thick cold-rolled steel metal air gap padding was placed onto a secondary structure with the same dimensions as the unpadded brush bar and welded to the existing set up to keep the test configuration the same. A production brush bar with production foam padding was also tested. Each brush bar was secured in place to prevent movement and aligned with an approximate 1.93 m long lightweight thin wall poly vinyl chloride (PVC) tube pendulum. The 5th percentile Hybrid III female head and neck was mounted at the end of the pendulum. The height of the pendulum was varied to obtain different impact velocities from 3.4 to 6.7 meters/second (m/s). The impact was offset from the head center of gravity (CG) by approximately 25 mm. The head was instrumented with a three orthogonal uni-axial IC 500G sensors model 3031 that measured the accelerations in the x, y and z directions and an ATA angular rate sensor mounted at the center of gravity of the head form. The angular acceleration was derived from the recorded angular rate by differentiation. All data were collected at a sample rate of 10 to 12 kHz. The acceleration data was filtered at SAE Filter Class 1000. The HIC was calculated over a 36 ms interval. The second study was conducted which incorporated a 25 mm CG offset side head impact. A tri-axial sensor accelerometer array was mounted in a 50% Hybrid III male head form along with an angular rate ATA sensor. Freefalling side head drops at approximately 5.4 meters per second were made onto a 47 mm diameter bare steel roll bar rigidly supported at each end. 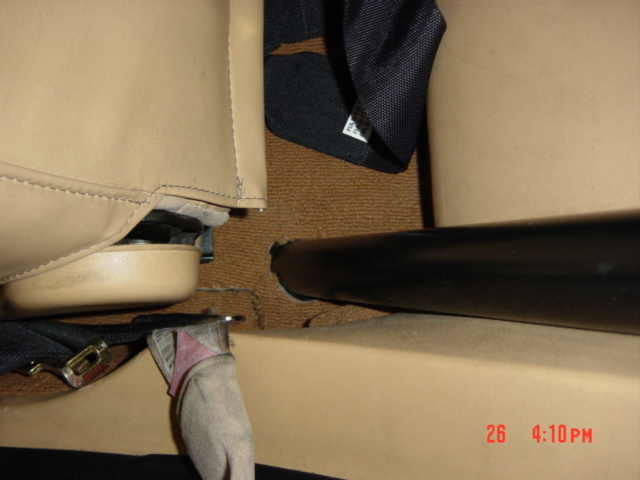 The roll bar was padded with standard production roll bar foam and two different commercial after market foams of 20 to 25 mm thickness and a comparable thickness metal air gap padding. All data were sampled at 10 kHz. The accelerations were filtered at SAE class 1000. The 36 ms HIC was calculated from the resultant tri-axial acceleration and the angular acceleration was derived from the angular rate sensor. The third study was conducted with a free falling Hybrid III 50% male head form at speeds of 5.4 m/s. An Entran EGE-73BQ-2000 tri-axial accelerometer array and an angular rate ATA sensor was incorporated within the head form. The head form was dropped onto the forehead with a 25 mm offset from the CG onto a 47 mm bare steel bar. 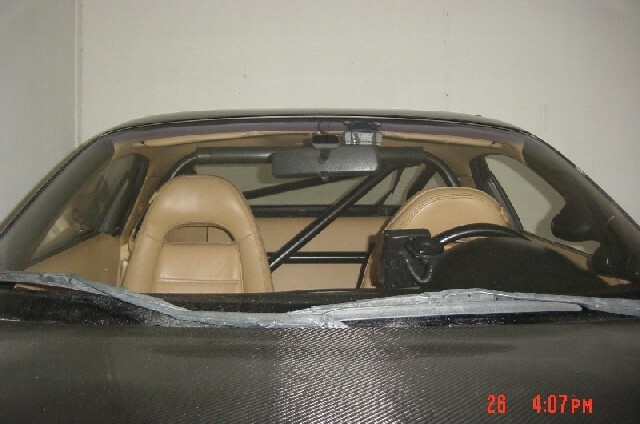 Seven mm standard vinyl and foam padding, 25 mm commercial racing roll bar padding, 25 mm Simpson racing roll bar padding, and 25 mm metal air gap padding were tested. All data were recorded at 10 to 12 kHz and filtered at SAE class 1000. The 36 ms HIC was calculated based upon the resultant acceleration. The first study demonstrated up to a 78% reduction in the HIC and a 72% reduction in the angular acceleration at impact speeds of 6.7 m/s.. The stock production approximately 25 mm thick brush bar padding gave an approximate 44% reduction in the angular acceleration and a 55% reduction in the HIC compared to the baseline production roll bar. All padding reduced the HIC, linear acceleration, peak angular velocity, and peak angular acceleration compared to the baseline production brush bar. The greatest percent reductions occurred at 6.7 m/s. The second experimental side-head impact study showed up to a 90% reduction in the HIC and an over 80% reduction in the angular acceleration at impact speeds of 5.4 m/s. 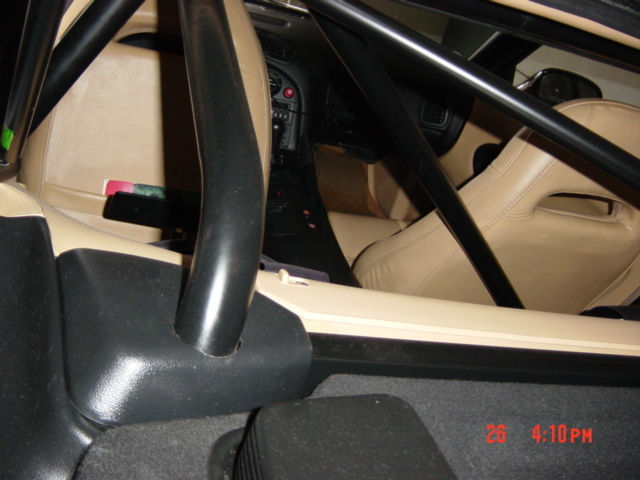 The stock vinyl and foam covering on the roll bar gave an approximate 17% reduction in the angular acceleration and a 13% reduction in the HIC compared to the baseline roll bar. All padding reduced the HIC and angular acceleration compared to the baseline roll bar. The third series of forehead impact experimental studies demonstrated up to a 90% reduction in the HIC and an 80% reduction in the angular acceleration at impact speeds of 4.5 m/s. 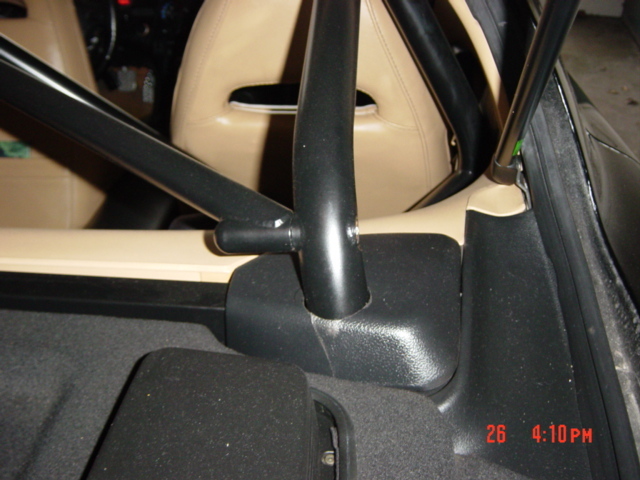 The stock vinyl and foam covering on the roll bar gave an approximate 15% reduction in the angular acceleration and a 28% reduction in the HIC compared to the baseline bar roll bar. All padding reduced the HIC and angular acceleration compared to the baseline roll bar. Various authors have cited human head injury limits or non-injurious levels of head angular acceleration. Lowenheim (1975) conducted studies on cadavers and mathematical analyses and concluded that bridging veins and head injury can occur at angular acceleration levels of 4500 rad/sec2. Ewing (1975) studied volunteer Navy pilots on the HyGe sled and found no brain injury for angular accelerations up to 1700 rad/sec2. Studies with human boxers fitted with accelerometers on their heads were conducted by Pincemaille (1989). The studies led to concussion ranges in the living human of 13600 to 16000 rad/sec2. Ommaya (1984) conducted studies with the non-human primate and scaled a brain injury level in the human of approximately 4500 rad/sec2. A review of brain injury models by Newman (1998) concludes that HIC may not predict injury correctly. He also extrapolates from the non-human primate studies of Thibault and the proposed scaling to the human to suggest that an angular acceleration of 8000 rad/sec2 is consistent with the lower tolerance limits of acute subdural hematoma and 12500 rad/sec2 for concussion and 15000 rad/sec2 for diffuse axonal injury. Margulies (1992) and Meany (1998) have developed various models supported by animal studies to predict human tolerance levels to angular acceleration. Recent studies by Mishimoto (1998) have been done to establish the hypothesis that diffuse axonal injury can occur with translational acceleration. McLean (1996) has shown through extensive analysis of vehicular injuries that brain injury does not occur without impact. In summary, a comprehensive experimental study was conducted to evaluate the biomechanical effects of various padding materials at different velocities using anthropometric 5th percentile female and 50th percentile male test devices. The HIC and angular acceleration were markedly reduced with the addition of padding materials. This observation was true for all padding materials and velocities. The present findings delineate the biomechanical importance of padding materials in the mitigation of head injuries.